Ratnesh Kumar reported Dr. Ravi with the complaint of Irritable Bowel Syndrome (IBS) which was his major problem since 10 years. He gets an urge for passing stool just after eating food. One more problem which he was suffering with was spondylitis, it had started 5 months ago and this problem has complicated his situation. He had high BP problem and dizziness almost every-time. He had problem while driving a bike. There was a continuous pain in the back, neck, and shoulders. He also had ringing in ear problem and he felt heaviness in head almost every time. Sometimes, he couldn’t even move his head and this problem was affecting his daily routine. He couldn’t work on a daily basis, as there was trouble in walking and there was also vertigo mostly in the morning but it also occured in the daytime. Considering all his problems Dr. Ravi started treatment process. When he came for follow up on 24th January 2017, he reported that there is 25% relief from heavy head problem. Now, he doesn’t feel problem in walking. Previously he feels heavy head and ringing in ear problem all the time but now there is relief. When he came for follow up on 21st Feb 2017, he reported that there was relief in his vertigo problem. Previously swimming of head was in 2 to 3 times in a day and it usually occur in the morning but now there is relief. He also felt relief in his IBS problem, there is no acidity and pain in his abdomen area. Now frequency to pass stool is reduced to once a day. There was a positive improvement in his condition. When he came to report on 18th April 2017, there was 50% relief in pain which was part of his daily life. There was relief in his IBS problem, no occurrence of diarrhea & constipation. He complained of pain in back and legs while walking and perspiration (sweating) in hands and foot. Considering all his problems Dr. Ravi made changes in his treatment process. When he came for follow up on 13th June 2017, he was happy with the treatment process as for the first time in these 6 months he came from Barabanki to Lucknow by driving the bike on his own and he felt no pain. 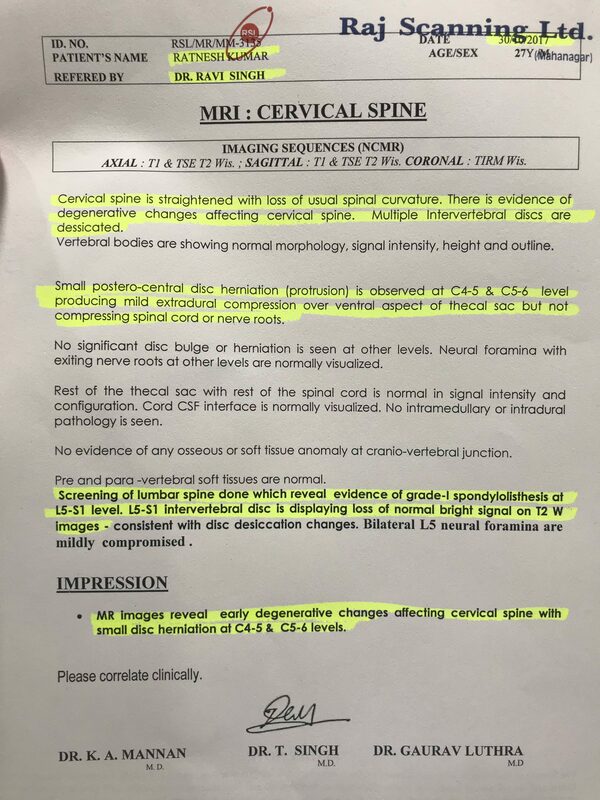 When he came for follow up on 8th August 2017, there was relief in his IBS problem but there was still a problem with his cervical. Previously he felt pain all the time but now only sometimes there was pain in his spine and shoulders while driving bike. His tingling and sensation problem was almost cured. When he came for follow up on 3rd October 2017, he reported that his IBS and hyperhydrosis problem was cured. There was reduction in pain. He felt pain after driving bike but not as much as before. He was happy with the treatment process. Previously he couldn’t walk, digest food and he was totally dependent on others. But within 6 months of treatment he could walk and drive bike. People didn’t believe when he told about this treatment process. He reported that there was no pain in the spine but whenever he used to drive the bike, after any jerk, he felt pain in the legs and hands. Dr. Ravi suggested to be conscious while driving bike because any jerk can affect and increase his cervical problem. On 23rd January 2018, he reported that previously he couldn’t manage the situation even for 1 hour when the pain occurs but now there is relief in his pain. His vertigo is also under control. When he came for follow up on 20th March 2018, he reported that he could now pick heavy things but the doctor suggested to avoid lifting heavy things. There was 90% relief in his condition, he is free from pain. He was continuing the treatment process. The patient visited the clinic, his pain is much better or almost gone in the day to day activity. Initially, he was unable to come to Lucknow without a helping hand. Now he has gone to Uttarakhand for Gangotri yatra. Every he was carrying his baggage. Now all his IBS symptoms gone, only sometimes constipation is there.